Battersea is an informal club and open to paddlers of all abilities, (complete beginner, novice, intermediate and advanced). Quite a few people have started out their paddling careers via Battersea Canoe Club and have progressed over time to a good standard. The diagram below shows all the various activities that we currently run and their suitability according to a required minimum standard. Note that this is just a guide. A trip or session organiser may decide that someone cannot safely participate in an event due to their ability level or the conditions at the time being unsuitable. Some people are happy to paddle on Flat water or Tidal Thames and may not want to paddle on white water. Many paddlers do not progress beyond the intermediate range of ability. The club caters for a variety of abilities and interests. 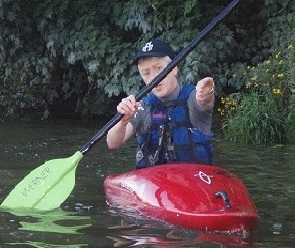 Please note that paddling on an intermediate/advanced trip does necessarily make you an intermediate/advanced paddler. An intermediate/advanced white water paddler must gain a lot of experience at that level in order to be deemed intermediate/advanced. Advanced white water paddlers have the ability to choose a line, paddle their chosen line in control and quickly correct any infrequent mistakes. They also have the ability to lead others and to provide safety cover at the level being paddled. For a more formal assessment of ability some members may want to use outside providers to be assessed via the BCU awards, leadership and coaching scheme. Each kayak discipline has it's own progression path. (e.g. river running, polo, surfing). Some members also participate, or compete, in other kayaking disciplines such as white water racing, slalom, playboating, sea kayaking etc., either with other members in the club, or through other clubs that specialise in their other discipline. 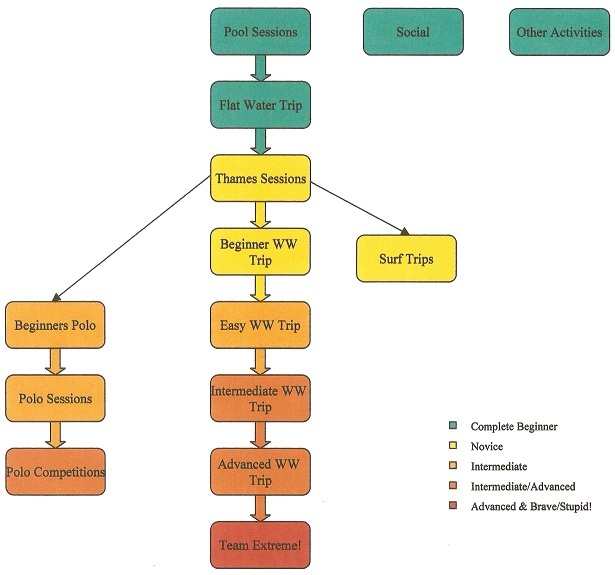 Click on any of the activities in the diagram below for more information or to display the relevant photo gallery.